Bill Mason - Gettin' Off. Vinyl LP. Bleep. 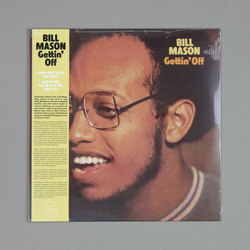 Bill Mason’s 1972 LP Gettin’ Off is given the reissue treatment courtesy of Tidal Waves Music. This is one of those soul-jazz rarities that is spoken of in hallowed terms by those in the know. Mason’s only LP, Gettin’ Off features some show-stopping play from the organist and his group. The likes of ‘Now Run And Tell That’ and the eponymous opening jam feature some barnstorming Hammond playing from Mason. He assembled quite a group to work on this one - the rhythm section consists of Idris Muhammad and Aretha Franklin/James Brown bassist Gordon Edwards, Quincy Jones’ saxman Hubert Laws toots his horn, and the desk is manned by the dynamic duo of Rudy Van Gelder and Bob Porter.